This shouldn't surprise anyone, as the latest Chromecast Preview firmware already started calling the app 'Google Home.' This move reflects Google's goal of integrating existing Chromecast devices, as well as the recently-announced Chromecast Ultra, into the Google Home ecosystem. To be clear, the Google Cast name is not going away. 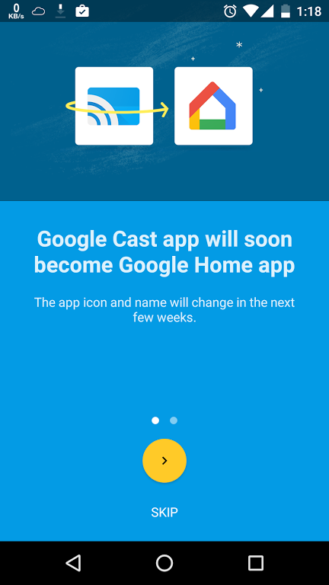 Google Cast refers to the technology used to 'cast' content from a host device to something like a Chromecast. For example, a TV or WiFi speaker could be "Cast-compatible."